England made it look comfortable against Montenegro on Monday night as they raced into a 5-1 lead after initially falling behind. Raheem Sterling was a constant menace for Gareth Southgate’s side in the final third as he created for his teammates throughout. 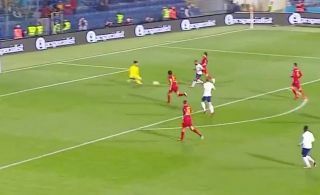 However, he took on a chance himself in the latter stages, as he not only raced clear in behind the defence by showing great pace and movement, but he showed brilliant composure to cooly slot the ball past the goalkeeper to extend England’s lead further. Having already bagged 19 goals and 16 assists in 40 appearances for Man City so far this season, this goal was yet another example of the clinical edge that he has developed in front of goal over the last few years as he looks much more prolific and confident in these situations. After the initial scare of falling behind in their Euro 2020 qualifier, Southgate will be delighted with the reaction he got from his players as their quality eventually told against a spirited Montenegro outfit.